The international market for U.S. dairy is extremely important. 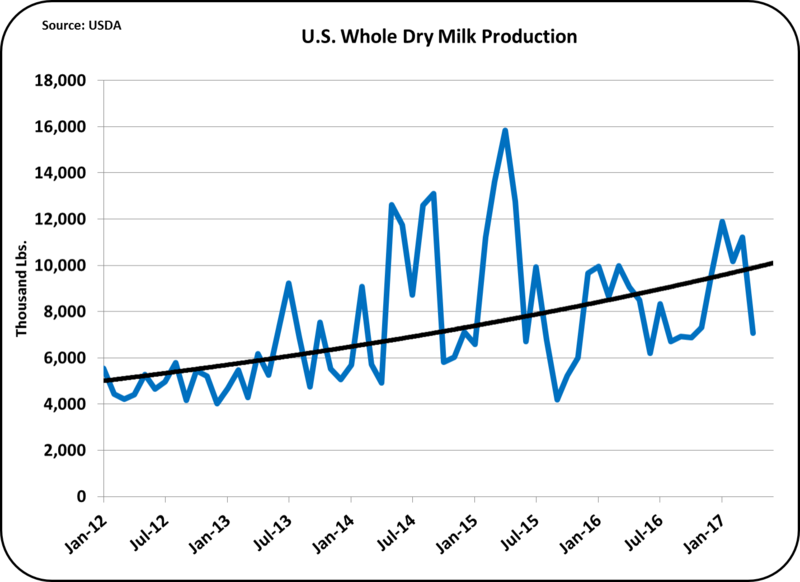 The swings can be significant and the markets can be changed overnight by political events and exchange rates, but the international market does offer strong demand for the excellent dairy products that the U.S. can produce. This post will provide an overview of the international market through the analytics of the big three exporters, the EU28, the U.S., and New Zealand. These three represent about two-thirds of the global milk production. The data used in this post is based on 2016 production and international markets. Chart I shows milk production from the three biggest global milk producers that dominate the international market. While New Zealand's milk production looks small compared to the EU28 and the U.S., they export around 95% of their milk and are a very key international exporter. Europe has been active in dairy for centuries and continues to dominate the global dairy category. The EU represents 28 different countries, but in economic terms they are viewed as one, with a common currency, the Euro. The U.S. has a smaller population and a smaller milk supply than the EU28. The population of the U.S is 323 million while the population of the EU28 is 510 million. The ratio of population to milk production are nearly identical. By contrast, the population of New Zealand is shy of 5 million. So the typical question is how and why should New Zealand has such a significant milk production. The answer is in exports. 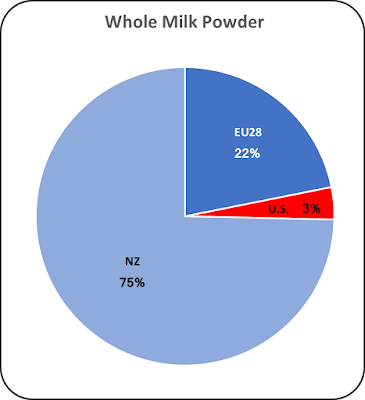 Depending on the year, the EU28 and the U.S. export 14 to 15% of their dairy production. New Zealand exports nearly 95% of its milk production. Cheese exports are dominated by Europe with 55% of the volume. European cheeses are prevalent around the world. Some are specialty cheeses and some are commodity cheeses. Their exports are well recognized and carry strong brand names. Perhaps surprisingly, New Zealand holds second place with 25% of cheese exports. Their processing and marketing arm, Fonterra, had done an excellent job in developing brands and promoting cheese sales in Asia and the Pacific rim. There is obviously a great opportunity for the U.S. to develop additional cheese exports globally. The U.S. in 2016 exported only 2.5% of their milk production in cheese. The EU28 exported 4.5% of their milk production in cheese and New Zealand exported 14.3% of their milk production in cheese. The U.S. is the leader in exports NDM/SMP as shown in Chart III. U.S. NDM/SMP exports has doubled in the last seven years. A doubling in 7 years requires a compounded growth rate of 10% annually. Exports of U.S. NDM/SMP are on track to hit another major high in 2017. Part of this growth is driven by the need for additional butterfat as U.S. domestic consumption of butter grows. 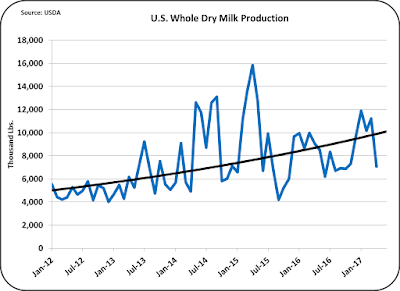 Also, production and export of NDM/SMP is forecast by AMS for major growth in 2018 if California becomes a Federal Milk Marketing Order. It appears that the U.S. will continue rapid growth in this category. 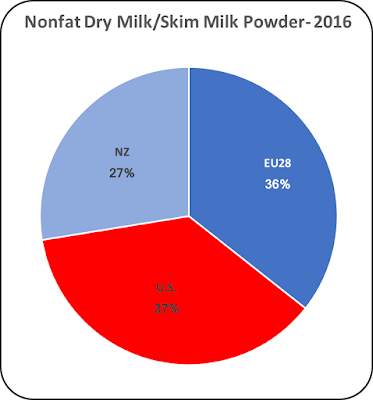 Finally comes a category rarely discussed in the U.S., whole milk powder (WMP). This category is dominated by New Zealand as shown in Chart IV. 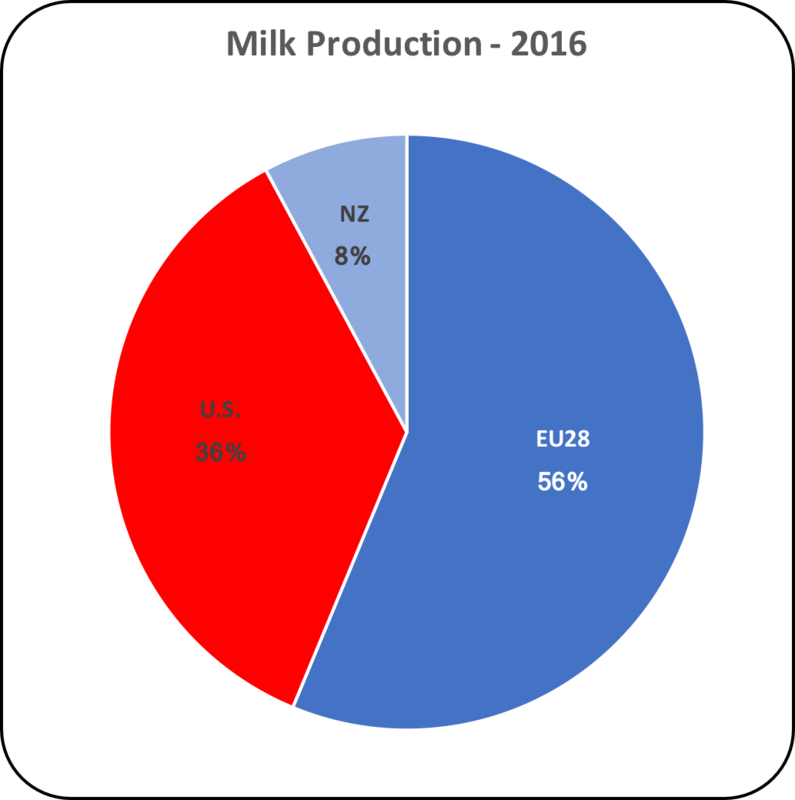 Of the 21 million metric tons of milk produced in New Zealand in 2016, nearly half went to the production of WMP. About 30% of that WMP volume went to China. There is no domestic market for WMP in the U.S., so producers are skeptical about producing a product that only has an export market. There has been growth in WMP production in the U.S., but it is still minuscule compared to NDM/SMP. What can be concluded from this brief view of the international dairy market? Growth in exports of cheese would greatly benefit U.S. dairy producers. More exports make increased demand and increased demand reduces inventories, and lower inventories make for higher prices. There is a 96% correlation between the price of cheese and the price of Class III milk, so with higher cheeses prices, producer milk prices will increase. This presents a significant opportunity for U.S. producers, processors, and exporters. There is room to grow this market as is demonstrated by the volume of milk exported by the EU28 and New Zealand. The growth of WMP is more difficult. Because of the butterfat in WMP, it must be protected from the air. In the presence of air, the butter will oxidize and become rancid. The traditional approach is to keep WMP fresh is to seal it in an oxygen proof barrier like a can and nitrogen flush the "air space" to eliminate the oxygen. Few companies are willing to commit to the equipment and packaging that is necessary to compete in this arena. The "bottom line" of this whole post, is that emphasis needs to be placed on further expansion of U.S. cheese exports. The U.S. has not taken its share of this market. Cheese is a significant growth market for U.S. consumption which reduces the risk of expansion. Exports of cheese are already increasing as analyzed in the prior post, and continued export momentum is key to the economics of the U.S. dairy industry.